I was fortunate to get in on the ground floor of Space Shuttle Operations and learned a lifetime of lessons in developing procedures and rules for operating that edge-of-envelope machine. My job was to put together Space Shuttle missions, train the teams, and to make sure that everyone comes home with the missions accomplished. It was exciting, rewarding, terrifying at times…and man, I got to “fly” the fastest, highest-flying airplane ever built! I grew up when fiberglass canard designs were all the rage. I was aware of the designs of one Mr. Richard VanGrunsven, but I had little metal-working experience, and I was reluctant to commit to what I envisioned as a a ten-year project starting with sheets of bare aluminum. Boy, was I out of date! Some people spend a long time making the decision to start a home-built project. I must have been ready, because after an hour with Van’s web site, I was hooked. I wanted an airplane that I could fly for as long as I needed an airplane. It would have modern redundancy and capability, yet retain the tried and true reliable aspects that had proven themselves in generations of light planes. I wanted something with innovative capabilities, but something that wouldn’t require any tinkering. I went through the cost estimator on Van’s web site, and came to the conclusion that this was doable. My RV-8 (Valkyrie), is a QuickBuild airframe with a very few cosmetic changes – map boxes in the cockpit, an enlarged electrical panel, a slightly modified empennage fairing. The firewall forward stuff is stock as well – a carbureted O-360 coupled to a Hartzell Blended Airfoil prop. I saw no reason to mess with proven designs, because I wanted to be flying quickly and reliably. I began construction in February, 2004, and quickly became addicted to building. It was hard to put the tools down and I often kept working past midnight. I logged every hour of “contact time” in the workshop, and the log showed 1040 hours when the plane was ready for its first flight in October of 2005 – just a year and a half after starting the tail kit. Not included in those hours was the time spent thinking about problems and tasks while going about the rest of my life, and hours spent on the internet (when I was traveling) researching equipment and building tips. I had the paint done professionally about six months after the first flight. The first flight in my new airplane was a culmination of a lifetime of desire and dreaming. I’d owned my Grumman for 23 years and I had flown many interesting types of aircraft. But nothing compared to the moment on the perfect morning when I taxied out and told myself “Well, we’re really going to do this…” I’d spent my life training for it – and I wasn’t disappointed. The RV-8 is everything that it promised to be. 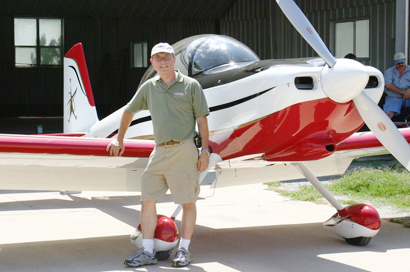 It has speed, range, carrying capacity…and it’s aerobatic to boot. You don’t move the controls – you think, and the airplane reacts. On trip lengths of up to a thousand miles, I can often beat a friend who’s going on the airlines in door-to-door travel time, because I can go on my schedule, and not the TSA’s. Postscript: Paul and RV owner/pilot Louise Hose met, married and formed a two-RV household. You will often find them arriving in formation, Paul in Valkyrie and Louise in her RV-6 Mikey. Both now write for, and work at, Kitplanes Magazine.